Country Dance in D Minor. Succeeding with the Masters, Classical Era, Volume One composed by Franz Joseph Haydn (1732-1809), Wolfgang Amadeus Mozart (1756-1791), and Ludwig van Beethoven (1770-1827). Edited by Helen Marlais. For piano. Classical. Succeeding with the Masters!. Classical Period. Late Elementary through Intermediate. Book. Published by The FJH Music Company Inc (FJ.FF1436).ISBN 1-56939-370-2. Classical Period.A collection of 26 graded repertoire pieces by Haydn, Mozart, and Beethoven. It provides a complete overview of the musical characteristics of the Classical Era in an easily comprehensible manner. Students learn practice strategies, musical concepts, and Contents include: By Haydn: German Dance No. 8 in G Major; German Dance No. 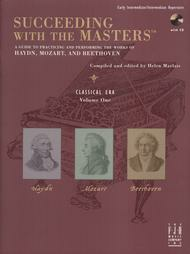 1 in G Major; Minuet in C Major; German Dance in F Major; German Dance in C Major; German Dance in B flat major; Minuet in B flat Major; Minuet and Trio in F Major; Dance in B f.About Succeeding with the MastersSucceeding with the Masters is a series dedicated to the authentic keyboard works of the Baroque, Classical, Romantic, and Twentieth-Century masters.This series provides a complete and easily accessible method for learning and performing the works of the masters. Each book presents the works in historical perspective for the student, and provides the means and the motivation to play these pieces in the correct stylistic, musical, and technical manner. The easily understandable format of practice strategies and musical concepts make this series enjoyable for both students and teachers.Succeeding with the Masters begins with late-elementary repertoire, continues through intermediate-level works and also includes a few early-advanced works. Upon completion of the series, students will be well prepared for the major keyboard works by the master composers of each era.